In order for things to get better, we need to be a little more virtuous. Have You Ever Wondered Why the Recidivism Rate Does Not Go Down? Our state and federal prisons fail to adequately prepare the 600,000+ people who return to society every year. (More than 95% of those who are incarcerated will come home.) They believe their job is to maintain security by keeping the incarcerated safe, the staff safe, and society safe, through effective security practices. Prisons do not engage in reform or correcting. Service providers, who receive funding based on ‘evidence-based’ practices and interventions that target specific groups and monitor the progress of their controlled groups, carefully record data on program participants, like lab mice, constantly throughout the procedure. But do the service contractors provide supply current and diverse resources to support people getting ready to come back to society No! No research has been done so no evidence has been generated, to provide the number one thing the incarcerated request for: RESOURCES. Instead, corrections and reentry staff in prisons and halfway houses ”refer’ people to ‘service providers’. (contractors who will call their call their wards ‘clients’) You can see how this has played out through the National Reentry Resource Center (NRRC) and the Second Chance Grant funding. 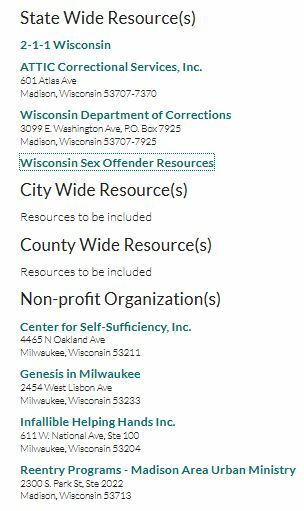 As you can see by this of the listing for Wisconsin (which has not changed in 2 years), out of the thousands of reentry resources available to people coming home, the NRRC only lists 7…plus the Wisconsin Department of Corrections. check out the reentry services directory that your hard earned tax dollars has built and then check out Fair Shake’s robust Resource Directory with thousands of resources for the state. But there is no evidence that it is important to put valuable resources into the hands of those who are seeking them? Since this is the most-requested reentry preparation item, I question who is conducting the research that provides NO evidence to support the incarcerated to have resources or Fair Shake to receive funding to produce and maintain a resource directory that people can use inside and outside of prison. Without the proper resources, tools and information, many of our incarcerated will not be successful upon release. In fact, even though prisons have applied more than two decades of ‘evidence-based’ interventions, still more than 75% of those who were released from prison between 2005 and 2010 returned to prison. Funding is available for Evidence-Based programs. But Fair Shake is not a program. Fair Shake feels people should be able to have the opportunity to find their own way. To build confidence, practice problem-solving skills, ask critical questions and create creative solutions. For most of his career, Kivel has focused on writing, education programs, and training programs designed to prevent male violence and youth violence, combat discrimination, and promote social justice, Gender Equality.